The South Caucasus is believed to be a significant geopolitical point in the world. For example, Brzezinski (1997) considers it as the “Eurasian Balkans”, taking into account its importance and tensions. Especially during the past two decades, the Nagorno-Karabakh conflict has had considerable influence in the geopolitical atmosphere of the region. Consequently, geopolitical rivalries have been concentrated on that conflict, too. This paper reviews Russia’s and USA’s interests in and around the Nagorno-Karabakh conflict. The hypothesis of this work is that the Nagorno-Karabakh conflict, for security and instrumental factors, has an influential role for both Russian and American interests in the South Caucasus. Since the start of the Nagorno-Karabakh conflict, USA and Russia have pursued various interests in and around that conflict. Their behaviors come from some circumstances both directly and indirectly related to the Nagorno-Karabakh issue. In this work, I review three dimensions of the interests of these actors: energy, geographic and geopolitical-instrumental. The structure of those interests is a complex one, shaping a system with four level triangles. The first level involves the three non-recognized and partly recognized subjects of the South Caucasus, namely Nagorno-Karabakh, Abkhazia and South Ossetia. The interests of the USA and Russia link to Nagorno-Karabakh somewhat through Abkhazia and South Ossetia as well, since all of them are undivided parts of the region and serve either as obstacles or as tools for the two great powers. Hence, developments on one of those conflicts definitely affect the whole geopolitical environment of the others as well. The second level triangle includes the three recognized states of the South Caucasus: Armenia, Azerbaijan and Georgia. As the core subjects of the region, all of them are under Washington and Moscow’s scope of interest. Since the Nagorno-Karabakh conflict is one of the key factors shaping the geopolitics of the South Caucasus, its prism of the second triangle looking from the parties of Russia and the USA is unavoidable. This triangle becomes more important, when we take into account that the internationally recognized parties of the Nagorno-Karabakh conflict (i.e. Armenia and Azerbaijan) with another conflicting state (i.e. Georgia) to build the second triangle. The third triangle consists of the three external powers immediately neighboring the South Caucasus: Turkey, Iran and Russia. These regional powers have interests strongly connected to the Nagorno-Karabakh conflict. Although Turkey and Iran are sufficiently independent players in the region, their interests in the Nagorno-Karabakh conflict are to some extent conditioned with Moscow’s and Washington’s interests as well. The involvement of Russia in the third triangle is explained by its immediate neighborhood of the region, which makes it a direct player there. 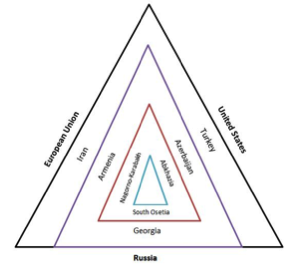 The parties of the fourth triangle are the USA, Russia and the EU. Here the latter is the weakest great power presented in and around the Nagorno-Karabakh conflict, that’s why especially Russia’s and the USA’s interests have been taken for reviewing in this paper.Noticeably, Russia is a party of both the third and the fourth triangles, because it has a super weight in the region and, in particular, in the Nagorno-Karabakh conflict. The overall picture of the interested parties in and around the Nagorno-Karabakh conflict is presented in the figure 1 below. To interconnect the countries of the South Caucasus, making the region more predictable and stable. The constructions of the abovementioned pipelines have strengthened the Moscow-Washington rivalry over the energy resources and communications of the region, where the Nagorno-Karabakh conflict, in particular as a security factor, has its special place. Hence, any possible renewal of war in Nagorno-Karabakh would put the valuable communications in danger, especially since they run in vulnerable distance from the conflict zone. For example, the Baku-Tbilisi-Ceyhan pipeline is located only 15 kilometers away from the northern border of Nagorno-Karabakh (Akgakoca et al., 2009; German, 2012: 226; Paul, 2010: 2). This means that the powers interested in the security of the pipelines should seek peaceful resolution of the Nagorno-Karabakh conflict or at least maintain the status quo there. On the other hand, since those pipelines aim to ensure the energy security of Europe in a way of bypassing the Russian supplies, Moscow needs to impede the effective implementation of those projects. In that respect, the Nagorno-Karabakh conflict is considered to be a handy tool with its potential to cause instability (Ismailzade, 2005). Geographically, the South Caucasus is situated at the cross-roads of the East and West, the Caspian Sea and the Black Sea regions, which makes it a significant region for the actors of the third and fourth triangles. That geographic potential is not only limited by energy communications but also for other economic and military purposes. Although energy communications also relate to the geographic dimension, however, due to their strategic significance they are discussed as a separate dimension. Geographically, Nagorno-Karabakh has both direct and indirect significance for the taken powers. Indirectly, it is again a strong security factor for other regional communications. For example, Azerbaijan serves as an air corridor for the coalition forces in Afghanistan and the American bases in Europe (Jones, 2005). Especially after the loss of Pakistan as a partner in the fight against terrorism, the role of the Azerbaijani air corridor has increased for USA. Logically, a new war in the conflict zone would jeopardize American deliveries to Afghanistan. Taking into account the American-Russian cooperation in the issue of Afghanistan, it could be claimed that here the Russian interests at least do not oppose the American ones. The geography of Nagorno-Karabakh is important for both the USA and Russia from the aspect of the Iranian issue as well. Since Nagorno-Karabakh is an immediate neighbor of Iran, any military attack to Iran may increase the possibility of using the Nagorno-Karabakh territory for anti-Iranian purposes (Jackson, 2010). Undoubtedly, from this point of view, the interests of Moscow and Washington are in disagreement. Therefore, they still keep the status quo, avoiding deployment of peacekeepers in those territories. The conflict is believed to be the main reason for the failure of the Armenian-Turkish rapprochement process, since Turkey tries to link those two issues, putting forward a precondition on the Nagorno-Karabakh conflict (Phillips, 2012). Although the USA officially refuses to see any links between the two processes, nonetheless, Turkey’s stern position definitely affects Washington’s approaches to the Nagorno-Karabakh conflict, since, in fact, the latter is the obstacle for achieving one of the most important interests of Washington in the South Caucasus (i.e. opening the Armenian-Turkish border). From Moscow’s perspective, this obstacle may be preferable, since regardless its official positive position to the Armenian-Turkish rapprochement process, the open border would increase Turkey’s weight in the region, which is the main regional rival of Russia in the Caucasus (Nixey, 2012). In this case, thanks to the Nagorno-Karabakh conflict, Moscow does not need to oppose the Armenian-Turkish rapprochement process, keeping its own positive image in it. Nagorno-Karabakh is a strong leverage in the Russian hand to keep powerful influence on Armenia and Azerbaijan. Being the key guarantor of the security of Armenia through bilateral and multilateral contracts, Moscow, however, expands military cooperation with Baku too (Deriglazova and Minasyan, 2011). Obviously, Moscow needs to prevent Baku to go out of the Russian geopolitical orbit, that’s why it tries to have balanced relations with Armenia and Azerbaijan. The fact that Armenia relies on the Russian security umbrella compels Azerbaijan to keep good relations with Russia to avoid Moscow’s absolute support to Armenia especially in the Nagorno-Karabakh conflict and in a possible warfare. Therefore, the current “no peace, no war” uncertain situation seems to be favorable to Russia in retaining a stable leverage over the region. On the other hand, looking through the prism of geopolitical rivalry, Washington needs to weaken the Russian influence on the conflicting parties by changing the current status quo, but only with peaceful means, since war will increase the uncontrollability of the region and will endanger the valuable pipelines. The Nagorno-Karabakh conflict, interrelated with other geopolitical processes in the region, has shaped a four-triangle structure of actors around it. Being players of the highest-level triangle, the USA and Russia, in a deep sense, have at least competing interests in and around the Nagorno-Karabakh conflict, since it is an influential factor for the geopolitical atmosphere of the South Caucasus. Based on the analysis of this paper, it could be claimed that in particular the security factor of the Nagorno-Karabakh conflict is essential for the taken countries’ interests. Specifically, the stability of the region and the safety of communications (both hydrocarbon and transportation) are highly dependent on the stability and predictability of the Nagorno-Karabakh conflict, which may be manipulated by the USA and Russia for their own interests. However, it is not only a security factor, but also a decisive geopolitical obstacle or tool for Washington and Moscow on the ways of reaching their interests in the South Caucasus. Especially the cases of the Armenian-Turkish rapprochement process and maintaining the Russian influence on Yerevan and Baku are of note. So, the hypothesis of this piece of work has been proved. Akgakoca, A., Vanhauwaert, T., Whitman R. and Wolff, S. (2009). “After Georgia: conflict resolution in the EU’s Eastern Neighbourhood”. EPC Issue Paper, no.57. Brzezinski, Zbigniew. (1997). The Grand Chessboard.New York, Basic Books. Deriglazova, Larisa and SergeyMinasyan. (2011). “Nagorno-Karabakh: the paradoxes of strength and weakness of an asymmetric conflict”. Caucasus Institute Research Papers, no. 3. German, Tracey. (2012).“The Nagorno-Karabakh Conflict between Azerbaijan and Armenia: Security Issues in the Caucasus”.Journal of Muslim Minority Affairs, vol. 32, no. 2, pp. 216-229. Ismailzade, Fariz. 2005. “The Geopolitics of the Nagorno-Karabakh Conflict”. Global Dialogue, vol. 7, no. 3-4. Jackson, Alexander. (2010). “Iran Manoeuvres for a role in Karabakh”.Caucasus Update, issue 66, 5 April.Available at: http://cria-online.org/CU_-_file_-_article_-_sid_-_86.html [accessed on 5 August 2012]. James Jones, Gen. (2005). Testimony by Gen James Jones. U.S. Congress Senate Committee on Armed Services, 1 March. Nixey, James. (2012). “The Long Goodbye: Waning Russian Influence in the South Caucasus and Central Asia”. The Royal Institute of International Affairs, Russia and Eurasia Programme, briefing paper, June. Paul, Amanda. (2010). “Nagorno-Karabakh—a ticking time bomb”.European Policy Centre, September. Available at: http://www.epc.eu/documents/uploads/pub_1148_nagorno-karabakh.pdf [accessed on 11 August 2012]. Phillips, David L. (2012). Diplomatic History: The Turkey-Armenia Protocols. Institute for the Study of Human Rights, Columbia University, March. Socor, Vladimir. (2012). “Azerbaijan Drives the Planning on Trans-Anatolia Gas Pipeline Project”. Eurasia Daily Monitor, volume 9, issue 164, 11 September.Available at: http://www.jamestown.org/single/?no_cache=1&tx_ttnews%5Btt_news%5D=39827&tx_ttnews%5BbackPid%5D=7&cHash=430fc4b90b81d7ab242768782e4ccbb5 [accessed on 1 September 2012]. Yergin, Daniel. (2011). The Quest. The Penguin Press: New York, NY. Russia and Georgia 2008-2018 – Escapism for the Sake of Peace? Be the first to find out about new analysis and stories! © 2010-2019 Caucasus Edition. All rights reserved. Full or partial reproduction of materials is allowed only with a reference to the Journal of Conflict Transformation as the source.